Due to its geographic and climatic diversity, the National Oceanic and Atmospheric Administration (NOAA) National Climatic Data Center has divided Utah into seven different climate divisions. Each division has a unique climate, which may suggest that different divisions throughout Utah will have diverse reactions to climate change. It is important to understand the climatic complexities of each division to determine how climate change will affect the health of various Utah communities. The meteorological indicators display temperature, precipitation and drought trends within each climate division that highlight the similarities and differences the seven climate divisions have regarding these indicators. 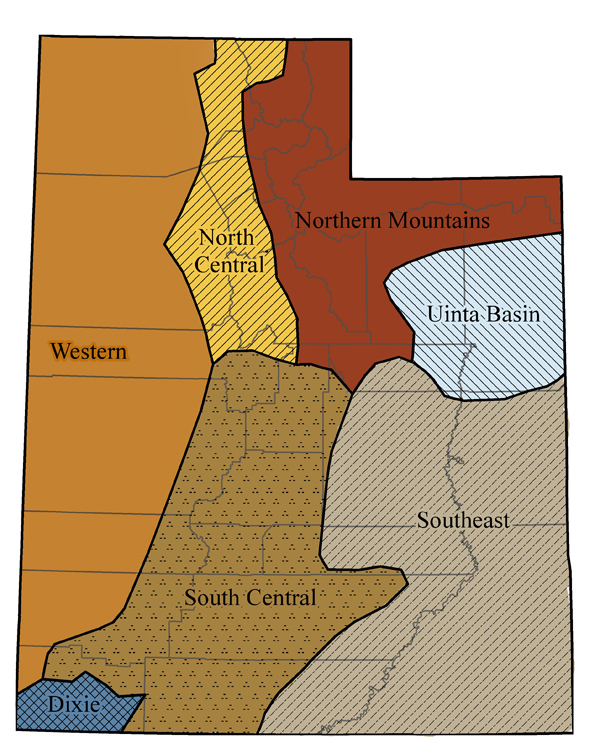 A map of Utah depicting climate regions in Utah, developed by the National Oceanic and Atmospheric Administration (NOAA). The information provided above is from the Department of Health's Center for Health Data IBIS-PH web site (http://ibis.health.state.gov). The information published on this website may be reproduced without permission. Please use the following citation: " Retrieved Thu, 18 April 2019 22:19:20 from Department of Health, Center for Health Data, Indicator-Based Information System for Public Health Web site: http://ibis.health.state.gov ".